He and every other Indian do, however, pay for such subsidized energy in other ways. Sethuraman must budget several thousand rupees a year (equivalent to several hundred US dollars) to rent a diesel generator for those occasions when the grid blacks out. He and other farmers in his neighbourhood also pool together once or twice a year to repair the government-supplied, but irregularly maintained, transformers that service their farms. The transformers, like India’s entire electricity grid, suffer from an unreliable electricity supply and from demand they were not built to handle. Low government-mandated prices and legal roadblocks by local politicians that limit the collection of fees both deprive state-owned utilities of cash flow. Without it, they cannot maintain the grid or extend it to more of the at least 300 million Indians lacking electricity (http://go.nature.com/dshxZ6). Sethuraman is representative of the fortunate few around the world — the International Monetary Fund reported in 2013 that the top 40% of the population in most developing countries received six times the energy subsidy received by the bottom 40% (http://go.nature.com/w1qdII). In the short run, he and others are direct beneficiaries, but in the long run, misdirected energy subsidies undermine economic development, according to economists at the International Energy Agency (http://go.nature.com/rPzFNR), the World Bank (http://go.nature.com/RJMxmO) and the International Monetary Fund (http://go.nature.com/E2wjfP). Such policies amount to an undeclared regressive tax that undermines investment in infrastructure, health and education for the poorest citizens. Of 40 countries examined during a Council on Foreign Relations workshop last year, for example, the average energy subsidy approached 30% of government revenue and was often greater than health or education spending (http://go.nature.com/pt37o7). Broad-based energy subsidies encourage recipients such as Sethuraman to make individually rational but collectively reckless energy-use decisions, such as the subsidy-amplified extraction of groundwater. They also discourage investment in more energy-efficient technologies. And as 80% of India’s electricity comes from fossil fuels, subsidized electricity amounts to subsidized emission of noxious and climate-forcing gases and particulates. Yet India is in the midst of an energy subsidy reform. It began reducing its own energy subsidies in 2010 and has earned outside recognition for its progress so far (http://go.nature.com/qAbZkw). Its path to an energy policy that supports its poorest people will be long and complex, but it may now be experiencing a remarkable moment of opportunity to widen access to energy. Several stages of that path are evident on national highway 76 in the state of Rajasthan, which winds through unlikely farmland in a desert landscape. A farmer squats on a harness between two buffalo, flicking them as they shuffle in a circle. The buffalo are powering a pump that slowly brings water to the surface. At the roadside and on south-facing exposed stones, dozens of brown animal dung patties dry in the sun, for use as cooking fuel. Animal-powered agriculture is still worthwhile here because rural electrification is still incomplete. Yet the cost of fuelling the buffalo’s internal combustion-powered equivalent — a car or a generator-fuelled water pump — has almost never been lower. Around the world, more and more people have access to clean, reasonably priced energy. But to reach the most recent United Nations development goal of universal access to energy by 2030, governments will have to better target their efforts. A billion people still lack electricity and some 3 billion still rely on dirty, inefficient power sources such as wood, coal and animal dung. Yet India’s energy subsidies, which peaked at almost 2% of gross domestic product, are keeping the stoves burning and the lights shining in the homes of the least needy. Those stuck with buffalo-dung cooking fires are paying for those choices with their lungs. India has been trying to reduce its energy subsidies for over a decade, but only actually began six years ago. One attempt in 2002 fizzled out with rising fuel prices in 2004. Despite cutting petroleum subsidies in 2010, by 2012 the government was spending a record US$22.8 billion a year on other fuels (http://go.nature.com/7SI7vH), especially diesel, while a report by government advisor Vijay L. Kelkar helped renew the fitful process of price liberalization and subsidy reductions (http://go.nature.com/vmlkDd). Until April 2015, India subsidized liquid petroleum gas (LPG) by selling below-market-price canisters to middlemen for onward distribution. This has now been replaced by delivering cash to citizens’ bank accounts instead. So far, low global energy prices have provided political cover. “We have seen some progress with the fall in oil prices,” says economist Joe Aldy of the Harvard Kennedy School. “There is this view that there is this sort of political opportunity to rationalize fuel prices when crude oil prices are low.” The important question, says Aldy, is are they brave enough to continue this when prices climb again? A delivery man wearing a handkerchief over his mouth pedals a bicycle with care between the motorized rickshaws, hand-drawn fruit carts and mopeds in Udaipur’s dust-choked market square. A banged-up red LPG cylinder lashed to the bicycle’s rear rack bears the words ‘for domestic use only’. As such cylinders were sold at below market price to shift domestic cooking from dirtier fuels such as wood and coal, the government banned their use in commercial settings. Yet the cylinders did not reach the poorest, most remote people. Instead, many were diverted for use by entrepreneurial but less needy Indians as automobile fuel, says Shruti Sharma, a Bangalore-based researcher for the International Institute for Sustainable Development’s Global Subsidies Initiative. India’s present government has adopted both a soft and a hard approach to rectifying such black market diversions. 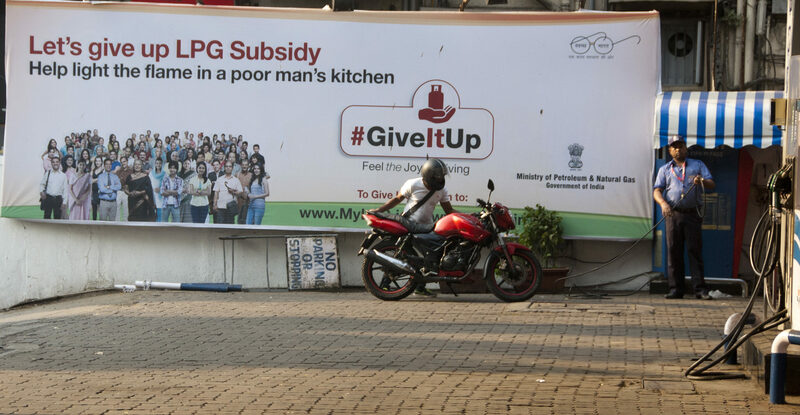 Today, visitors to petrol stations alongside Jaguar dealerships and in comfortable tree-lined residential districts in Mumbai can see billboards that exhort better-off citizens to ‘give it up’. The publicity campaign urges citizens to sign away their LPG subsidy bank transfer, something LPG providers claim over 10 million Indians have done (http://go.nature.com/Q8NFAp). The campaign may have saved the government a few dozen million US dollars so far, according to the Global Subsidies Initiative. In addition to its soft-touch campaign, the government put limits on the number of underpriced canisters a family could collect, and then raised prices. Unlike the diesel subsidy reform that preceded this one, the LPG reform offers direct cash transfers for Indians earning less than 1 million rupees (US$30,000) a year, which may win the reform some political cushioning. For example, university student and travel guide Gaurav Kadam, who lives in informal housing in Mumbai, is not too perturbed by his family’s experience of the LPG subsidy reform. He says his household used to pay 500 rupees (INR) for an LPG canister. Now it pays 700 INR, but also receives a 125 INR monthly bank transfer. He says most residents in his neighbourhood have bank accounts and can take advantage of what remains of the subsidy in its new format. India’s energy production and distribution also lags behind its demand. At Jodhpur airport recently, the lights went out, fans whirred to a stop and foreigners glanced around to see what had happened. Unperturbed check-in agents continued typing details in to generator-powered computers until the lights flickered back on. Such blackouts are one of the visible prices of underinvestment in India’s electric grid. They are even more common and last longer in rural regions, where infrastructure repair costs are higher and where subsidies, both formal and informal, leave utilities underfunded. In the western state of Gujarat, the electric utility’s desperation for reliable income grew to the point of building a physically separate grid for agricultural users. If successful elsewhere, such a scheme could enable the utility to recoup more of its investment from more reliable domestic consumers, and permit more investment in expanding the domestic grid. Yet government efforts to manage grid demand are sometimes stymied by savvy users. Gurumoorthy Sethuraman’s grandson Manu Ravishankar, a policy associate at London consultancy the Carbon Trust, says that the utility in Arayapuram sometimes tries to ensure a more consistent residential supply — which is distributed via two-phase cycles — by reducing the free supply to commercial customers such as farmers, distributed via a three-phase signal through the same cables. So agricultural users, whose hardware requires a three-phase supply, have taken to installing phantom phase capacitors that convert the two-phase signal into a three-phase one. This strains the capacity of the grid, forcing brownouts onto all users and damaging their hardware. “Farmers are paying a massive cost for the electricity, even if they don’t realize it,” says the younger Ravishankar. Similar appropriation of electricity occurs in the cities. Near where Kadam — the student and travel guide — ends one of his tours in Mumbai, a couple of electric cables, probably an informal connection, dangle from a flower-garlanded tree, ending at about head height with a plug and a switch. At the other end of the cables, a small brick structure encases dozens of electricity meters, but they do not appear to reflect the tangled uses of each outbound cable. One meter, perhaps owing to neglect or tampering, flashes ‘Er 000’. Informal electrification is rife. And just as in rural settings, urban extralegal connections strain the grid. On a more optimistic note, Banerjee estimates that perhaps two-thirds of Indians who still lack electricity in their homes live in municipalities that have grid supply. This bodes well for achieving the government’s long-delayed full-electrification goal, as the cost of connecting homes to a municipal grid is far lower than that of extending a grid to more remote unserviced locations. It is so cheap that the World Bank recommended providing free connections: enough residential users are likely to pay their usage fees, providing a steady stream of future income, to justify the utilities picking up the connection cost. There is also plenty of scope for cost savings by retargeting subsidies using means testing, much as is now being done for LPG: the World Bank estimates that some 87% of India’s electricity subsidies go to Indians making more than the government-defined poverty line (http://go.nature.com/qAPdny). While most of India’s necessary power capacity will continue to come from coal for the foreseeable future, at the Paris climate talks late last year Prime Minister Narendra Modi called for major international investment in solar energy. Already, many companies are rushing to test different business models for renting or selling solar panels to small business owners, who often in turn sell some of the panel’s spare charging capacity to neighbours. Other changes are top-down: the government offers a 15% capital subsidy for private rooftop solar panels, in addition to other tax-related incentives. Last year, Modi also updated India’s goals for solar power to an unprecedented 100 GW of solar capacity by 2022 (http://go.nature.com/xp3UUJ), up from around 4 GW today of India’s entire power generation capacity of around 272 GW. Solar power’s wholesale price of 5–6 INR kWh−1 is still uncompetitive with the going rate on India’s grid, which can draw on coal at less than 2 INR kWh−1. To compensate for the disparity, the Indian government plans to spend around US$2.25 billion of its own money and attract an additional US$98 billion in outside investment for solar power. Late last year it also began requiring coal plant operators to sell their power bundled together with solar power. This system forces some of the risks of investing in solar onto producers of coal power, but it does not solve the original problem of recouping costs from delinquent users. However, when solar power reaches unsubsidized price parity with other sources of electricity, it may serve as a better solution for electrifying the most remote, off-grid locations. This is, in part, because too much intermittent supply will overwhelm the capacity of the creaking national grid to manage loads. This is where many of the private off-grid or so-called mini-grid initiatives, such as that led by OMC Power, will begin to pay off. OMC can install a 50-kW-capacity photovoltaic solar panel in districts with around 500 households and where the company can strike a deal to supply the mobile network base station. The station provides them with a steady baseline income and the business then sells remaining capacity to individual households and other small businesses. It has at least 70 such micropower plants operating now in the northern state of Uttar Pradesh. Such micro-grids are a natural complement to grid extension, but they require a lot of upfront capital investment. They are also where Gurumoorthy Sethuraman places his faith in future power. “We are living in a tropical country…even in rural areas, solar energy is becoming possible,” he says. Government analysts agree — they estimate India’s potential solar power capacity at almost 750 GW (http://go.nature.com/W5w8OF). Five villages near Arayapuram have paid for solar installations from their own money, but Sethuraman says this is rare and that the government should step in to increase the pace of building. However they are funded, India’s earliest solar panels already hint at a possible future of energy: cheaper, more widespread and with ever smaller distances between power sources and users. In addition to devolving power sources to be closer to citizens, information about the flow of electric power, energy and subsidies may also be ever-more accessible to Indians, too, as their government shifts more subsidies towards direct transfers. An income-based cash transfer replacement for the kerosene subsidy was scheduled to begin in April 2016, similar to the natural gas reform of 2015. Indian newspapers have reported that the government is already experimenting with using the cash transfer subsidy replacements for some food subsidies and speculating that it may do the same in the future for fertilizer subsidies. The government’s new emphasis on “trying to bring all transactions online and visible,” as Sharma puts it, means that many subsidies that were once entrusted to distributors and dealers will now be more visible, making theft and black-market side deals harder. Reformers “see this as cutting down on the middleman,” Sharma says. But it will require the government’s Aadhaar universal identification card to fulfil the middleman’s old responsibilities. The Aadhaar is the world’s most ambitious national identification scheme, intended to include biometric data and to allow India’s many different agencies and authorities to rely on one easily verifiable identifier. Since its inception in 2009, the programme has enrolled almost 800 million people at a cost approaching US$1 billion. It is also subject to numerous other complications, including a Supreme Court case. “India does have the ability now to put these kinds of subsidies on this Aadhaar,” Banerjee, of the World Bank, says. The question is whether it will manage to get all of its people onto the Aadhaar in time to bridge the old middleman-mediated subsidy regime with the new, bank-mediated system. For those lacking bank accounts and those who share family food ration cards, the end of cheap petroleum, diesel, LPG canisters and kerosene also means the end of cheap energy, higher production costs for basics (including food) and higher transport costs. At present, the number of LPG subscribers and bank accounts in India simply do not match up, according to Sharma. If there is one thing that unifies India’s quest to rationalize its energy subsidies, it is the mutability of energy and the difficulty of controlling how its people will use it. The government’s present kerosene subsidy is intended to light the homes of the poor — a noble goal similar to the goal of subsidizing natural gas to promote cleaner cookstoves. Yet, just as with natural gas, some people have diverted subsidized kerosene and blended it into transport fuels. This creates unintended consequences, cheapening transport at the cost of dirtier emissions from vehicles and from households that might revert to even dirtier forms of lighting. That is unlikely to change as long as people can hide the true costs of energy subsidies. First published by Nature Energy: [html] [pdf].